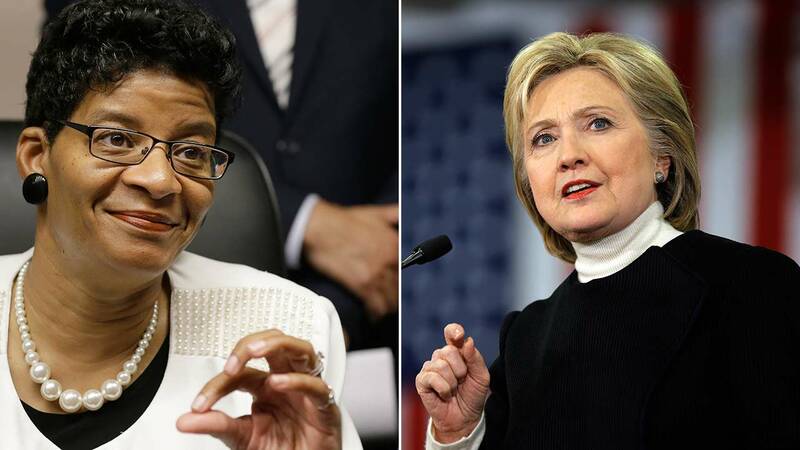 WASHINGTON -- Hillary Clinton will campaign next week with the mother of Sandra Bland, the Chicago-area woman who was discovered hanged in her jail cell three days after being pulled over for a routine traffic stop near Houston. Geneva Reed-Veal will join the Democratic presidential candidate at a Feb. 17 voter mobilization event in Chicago. Bland's death has become a symbol of the racial inequalities in the criminal justice system. Her family, black leaders and other activists have questioned her treatment by white law enforcement officers and the determination she committed suicide. Clinton is trying to boost her support among minority voters ahead of contests later this month in South Carolina and Nevada, where African-Americans and Latino voters make up a sizable part of the electorate. After an overwhelming defeat to rival Bernie Sanders on Tuesday night in New Hampshire and a razor-thin win in Iowa last week, two largely white states, Clinton hopes her support in the minority community can fuel a comeback. "African-American parents shouldn't have to worry that their children will be harassed, humiliated and even shot because of the color of their skin. Immigrant families shouldn't have to lie awake at night listening for a knock on the door," Clinton said in her Tuesday evening concession speech. Other African-American mothers whose children were victims of gun violence, including Gwen Carr, mother of Eric Garner; Maria Hamilton, mother of Dontre Hamilton; and Lucy McBath, mother of Jordan Davis; are planning to campaign for Clinton in South Carolina in the coming weeks. Sanders aides said the Vermont senator isn't as well-known as Clinton, one of the country's most famous politicians, within minority communities. They plan to promote his personal story, arguing that his early work as a college civil rights activist and his message of economic equality will help diversify his support. "Bernie Sanders has an incredibly powerful story to tell," said adviser Tad Devine. "His fight for equality and civil rights, his fight against inequality and economic injustice is very, very powerful. It's going to resonate with the African-American community." African-American leaders backing Clinton targeted Sanders on Wednesday, saying he's done little to help their community with gun violence, criminal justice inequities or civil rights. "Hillary Clinton has been a true friend to the African-American community for nearly 40 years," said Rep. Hakeem Jeffries of New York. "During that time, Sen. Sanders has been largely missing in action." Dr. Hazel Dukes, president of the NAACP's New York State Conference, attempted to undermine Sanders early work on civil rights, saying "thousands walked" in the historic 1963 civil rights march on Washington - a part of his biography Sanders aides say will help win minority voters. "He doesn't come from a part of the country where African-American politics are a daily part of political life," she said. "Here in New York state, it is our daily life and I can tell you Secretary Clinton has been there for us." Earlier Wednesday, Sanders had breakfast in New York with the Rev. Al Sharpton, who said the two men talked at Sylvia's Restaurant about affirmative action, police brutality and the water disaster in Flint, Michigan. "I think it is very important that he sent the signal that on the morning after a historic victory ... he would come to Harlem and have breakfast with me," Sharpton said, adding that he planned to meet with Clinton next week and would not make an endorsement before then.